Introduction: Prostate Cancer (PCa) is the second most common neoplasia in men. Because it is often diagnosed at a late stage, mortality rates remain high. Studying cancer metabolome, which reflects early changes that occur in cells, has gained relevance and may contribute to the identification of early diagnostic biomarkers and understanding tumor biology. Methods: Fourier-transform infrared (FTIR) spectroscopy is a metabolomics technique that probes the biochemical composition of the analyzed samples and allows to discriminate samples with distinct metabolic profiles, allowing the discrimination between cancerous and non-cancerous samples. 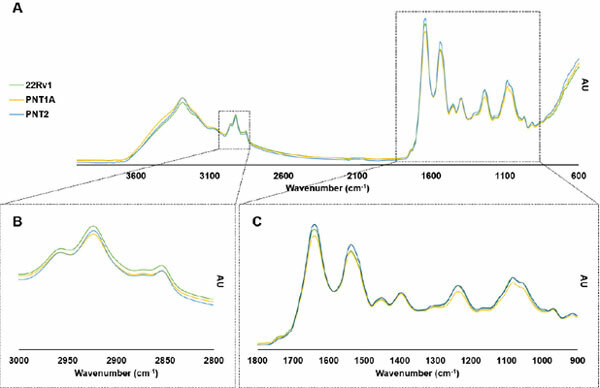 In this study, FTIR spectra were acquired from PCa and normal prostate cell lines and analyzed by Principal Component Analysis (PCA). Results & Conclusion: Our results indicate a clear discrimination between the different cell lines, meaning at they exhibit distinct metabolic profiles. This discrimination can be attributed to an altered lipid metabolism (3000-2800 cm-1, 1800-1700 cm-1 and 1500-1400 cm-1) and changes in protein conformation (1700-1600 cm-1). These results suggest that studying cancer metabolome with FTIR spectroscopy not only allows the understanding of tumor metabolic behavior and may be useful to the development of new therapeutic targets. Prostate cancer, cell lines, metabolomics, FTIR, metabolic profile, principal component analysis.